Learning how to transform your habits can seem like a feat when just getting started. We make dozens of choices every day, without really knowing it. Whether it's deciding to cook vs. ordering pizza, going to the gym vs. watching another episode of Netflix, or munching on your veggies vs. snagging a donut from the break room. All of these decisions can be downright draining. On top of that, do you ever notice how much harder it is to make the healthy choice when you're already tired? I'm not well-known for making smart food choices when I'm mentally drained. Without even knowing it, with every choice or decision, our energy crawls away from us a little bit. To what do we owe this difficulty, and how do we fix it?! Some may claim having a lack of willpower. But is this just an excuse for deeply ingrained habits? I'm no psychologist, nor do I have perfect habits, but I have done a fair amount of research because I find this topic fascinating. As a Personal Trainer, helping my clients find easy ways to turn their unhealthy behaviors into a healthy behavior is the first place I start. It's essential to your health and success. When a behavior is made automatic, this is considered a habit. Each habit we have yields a certain reward or outcome. Just like your morning coffee gives you energy, your workout makes you feel good about yourself and brushing your teeth makes your mouth fresh! If you want to create a healthier habit, you must try to find a healthier routine that yields the same reward. This is the key to transform your habits in a positive way... but more on that later. Many researchers have said that we may have a limited amount of willpower. This is referred to as our willpower reserve and it can be depleted. There are tons of decisions we make each day that deplete this willpower. Resisting the urge to scroll social media while at work. Turning down the chocolate cake for a lighter option. We exert self control in each of these situations. Because of this, it can be physically draining once we reach the end of that reserve. And what happens then?! Naturally, it becomes much more difficult to make healthy, reasonable choices and have self-control. The good news: some researchers state that, like a muscle, willpower is able to strengthen and grow over time. The other good news: your personal beliefs and attitude could affect your willpower. Someone driven more by internal goals/desires may feel like they have to exert less self-control (i.e. if weight loss is the goal, it will be easier to make the healthy choice, thus exerting less self-control). Which one has a greater influence over your decisions? Habits. Or Willpower? Habits. Forming good habits will cause you to use less "self-control" so you can save that willpower. It's less energy draining. Think about it. If you nail down the habit of going to the gym every day and learn the rewards involved, the "should I go to the gym today?" question shouldn't be a hard decision to make. A good habit is automatic, requiring little to no willpower. That being said, you are less likely to be tempted by other things (happy hour, netflix, etc.). We want our new habit to stick so we don't have to suffer the agony of making the right choice again. So how do we go about training our MIND to make conscious, healthy choices?! First things first, pick one habit to focus on at a time. Sure, maybe you want to eat more veggies, snack less after dinner and spend more time walking your dog. Pick one to start. The trick will be making it super easy to perform so it becomes part of your routine. Since learning a new habit will be hard at first, start your day with the this task. As our willpower and self-control wear down throughout the day, it becomes harder to make the right choice. So, for the sake of learning, move the tasks that require the most willpower to the beginning of the day. Let's use the example that you're looking to nix your habit of mindless snacking. Whether at work or home, you snack without thinking about it, and these calories are beginning to add up. For every decision, there is a cue that leads us to make it. In this example, the cue could be that you saw the leftover Halloween candy on the counter. Or, you're watching you favorite show and you always snack during that. Pay attention to what that trigger or cue is for you. Once you identify that, move on to step 2. Now that you've identified your cue, you can focus on changing your routine. This part is all about re-programming the mind with a new behavior. If you see that candy jar out in the office and you're mind automatically tells you to "go ahead and take some," you need to replace this action with something else. Maybe instead you could go to the drinking fountain for some water. In other words, find a different action for your cue. Finally, we must link this new behavior to a reward! It doesn't have to be anything material. Just having the satisfaction of knowing you turned down the office snacks might be enough. Or, feeling more empowered for making the healthy choice. Whatever it may be, it must make you feel good, just as your snacking once did. By adding in healthy behaviors, instead of restricting ourselves, we become more mindful and conscious. As new habits are created, old habits begin fade. Healthy behaviors tend to breed MORE healthy behaviors, so if you're on a roll, keep going! Remember, 1 habit at a time. Be patient and trust the process. Do you have a habit change story to share? 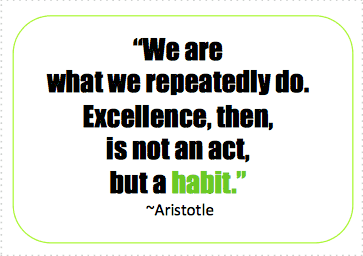 What is a new habit you'd like to change or develop? I'd love to hear in the comments below.